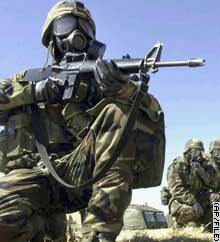 U.S. Army 1st Cavalry Division soldier seen in file picture during chemical attack training. 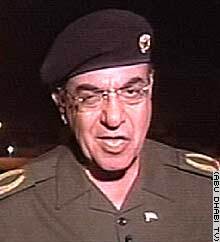 BAGHDAD, Iraq (CNN) -- Iraq's information minister said Friday that coalition forces -- not Iraqis -- might resort to weapons of mass destruction out of frustration and defeat. Mohammed Saeed al-Sahaf disputed U.S. reports that Iraq might be planning to use chemical weapons or nerve agents because U.S. forces found 3,000 chemical protective suits and nerve agent antidote injectors. "The Iraqi soldier is prepared and supplied with the latest including a gas mask," he said. "[The U.S. knows] that soldiers in war should be prepared for any situation that might arise ... and the masks are part of this." Al-Sahaf said U.S. forces could use weapons of mass destruction "because of frustrations and their defeat and the resistance that will increase day by day." Britain's Defense Ministry denied al-Sahaf's claim. "We have enough conventional weapons in theater but even if the going got tough we'd never make first use of weapons of mass destruction," a spokesman told CNN. "We've said before that if Iraq made first use of weapons of mass destruction we'd consider using them too. We don't have them in theater at the moment but we could get them there pretty quickly." The Iraqi minister also criticized U.S. bombings of government buildings in Baghdad, saying coalition forces were "targeting ministries as if no civilians go into these buildings." "In these buildings are civilians that go there to do their business," he said. "When they target these buildings, they also hit houses and homes next to these buildings." Al-Sahaf says coalition forces are failing to make progress in Iraq. Al-Sahaf said coalition forces were targeting civilian areas on the outskirts of Najaf, about 100 miles south of Baghdad. "They bombed civilian neighborhoods and those cowards used cluster bombs," he said. Coalition officials flatly deny charges they are targeting civilians, although they say Iraq places military equipment close to civilian areas in hopes of seeing coalition bombs kill civilians. The information minister also said coalition forces "met with resistance" from Najaf residents and the Fedayeen Saddam, a paramilitary group said to be loyal to Iraqi leader Saddam Hussein's son, Uday. "The campaign that targeted Najaf resulted in a failure and they retreated," he said. Iraq's health minister, Umid Midhat Mubarak, said Thursday that more than 350 Iraqi civilians have been killed and about 3,700 wounded since the U.S.-led invasion began. Al-Sahaf denied statements made by Gen. Richard Myers, chairman of the U.S. Joint Chiefs of Staff, about reports that the Iraqi regime was attacking its own citizens. "He must be crazy," he said, calling the reports "basic propaganda." Al-Sahaf said an Iraqi farmer destroyed an American tank with his rocket-propelled grenade. "We salute him, this hero, who embodies the courage of our people," he said. "Our farmers, they are targeting accurately the enemy." He also said an Iraqi citizen in the southern province of Al Muthanna hit a coalition helicopter.